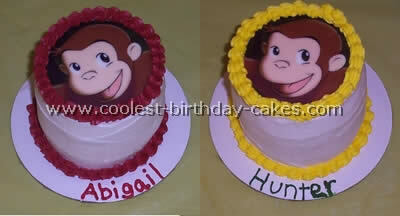 I used several ideas from this site to come up with this Curious George cake. I baked two 9-inch rounds and made two batches of buttercream frosting, one chocolate (some light for his face some darker for his hair) and one vanilla. I use the Wilton buttercream recipe. I used the darker chocolate frosting for the filling and assembled the layers. I then frosted the whole cake with the vanilla frosting. I used a drawing I made off an internet image to outline George (I like the "classic" George a little better and it was easy to draw) and used Wilton black icing to outline his features on the cake. I then piped stars for the hair and face and added the final touches (nose mouth ear). Two licorice Jelly Belly beans were used for the eyes. I also added banana Runts around the sides of the cake and piped chocolate stars around the bottom. 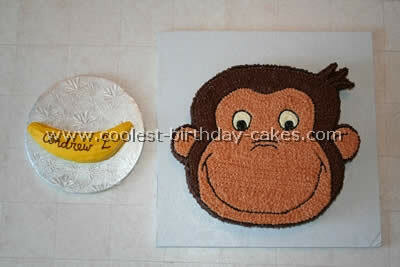 This Curious George cake was so easy and my son loved it! I was excited to make my son’s 1st birthday cake, a Curious George cake. He is my little curious George, always into everything. I started out with a Wilton Animal Cracker cake pan for the face. I had to build up the nose a little with more cake so the face would be flat. I copied off the Curious George mask from pbs.com and used it as a template. I blew up the mask to the size that would cover the cake, actually just a little bit under. I laid it on top of the cake and cut around the image to get the outside of the cake set up correctly. I then copied just the light brown face area onto a piece of wax paper. I rolled out Wilton light brown fondant and laid the interior face section on the fondant and traced around it with a knife. I then cut the eyes out of the fondant. I took this section and laid it on the cake. I also cut out his ears in the fondant. I then piped the brown hair on and added the details on to the face with black icing. It was so much fun. To make the banana I made a round white cake and laid a real banana on top. I cut around it with a knife and then piped long strips of icing onto the cake. I was so pleased with how this Curious George cake turned out. 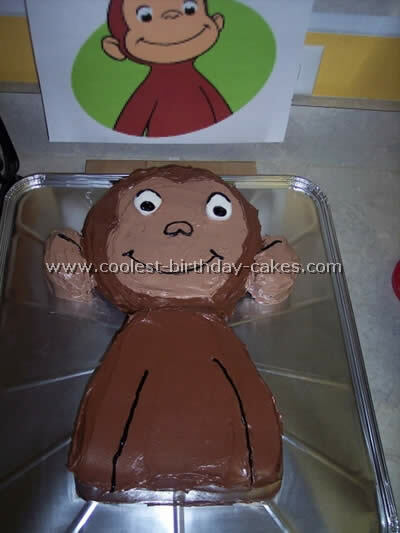 I got this idea for a Curious George cake from a picture I’d seen and the fact that my two year old has many of George’s traits. I used the Wilton Wonder Mold pan to bake the hat, covered the base (a 12×12 cake pan) in green fondant and the hat in yellow fondant and drew little bananas and palm trees on the base with buttercream icing. 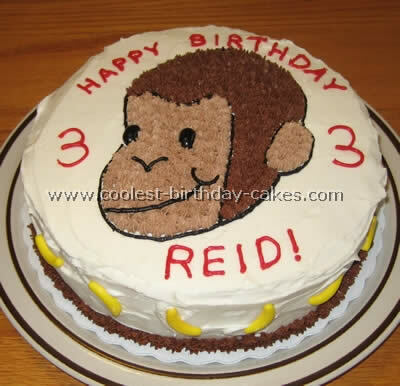 I used a plush Curious George for two reasons – one it would be way too time consuming to make and two this way my son would have a keepsake from his birthday cake! 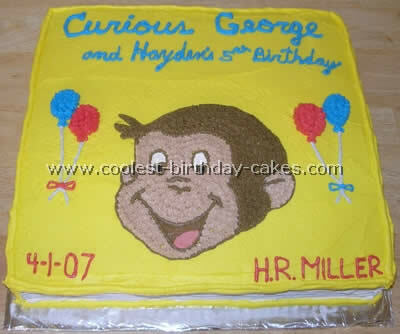 This Curious George cake was for my Godson’s 5th birthday and he loved it! I used a large square cake pan. To decorate I iced the three sides of the book with white for the pages then piped out the outlines with yellow and then filled in the rest. I used gray to create the illusion of pages. For George I printed a picture to outline his face and then filled it in. The rest was done free hand. George can always bring a smile to your face! My daughter loves Curious George and so we decided to have a Curious George cake for her 2nd birthday. Since I like to make my children’s birthday cakes, I had to come up with an idea for this one. 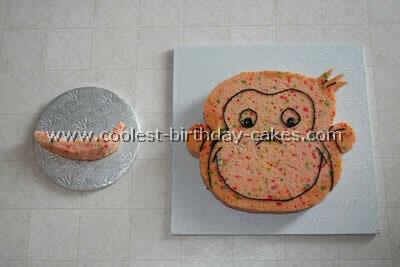 How to make a Curious George cake, I decided just to do a large cake with his face on it. I bought tiered wedding cake pans so that I could have the largest round cake pan I could find (because we were having 50 people here for the party and needed a large cake). I bought Betty Crocker yellow cake mix (for the large pan I used 1 1/2 cake mixes for each pan) and baked two layers. I waited for the cakes to cool and the put pink strawberry frosting between the two layers to add some flavor and some pink since it was for a little girl. 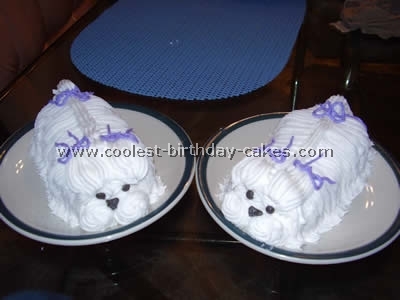 I then frosted the whole cake with vanilla whipped frosting from Betty Crocker and let it set for a few minutes. Then with my pampered chef cake decorator, using the star tip put small stars of chocolate Betty Crocker frosting in rows down the sides. I then used the same star tip; put smaller yellow stars around the bottom and top edge of the cake. I then sketched out the head of Curious George onto the top of the cake (I took the plates that I bought for the party and copied one to get a stencil for the head, make the image larger the bigger you need the cake) and then I went through with the chocolate frosting and the star tip and added small stars as fur and filled in the sketched out area to make George’s head. I then added a pink heart balloon with a yellow string and #2 since it was my daughter’s 2nd birthday. I did this with the canned colored frosting that you can but at the grocery store. it comes with several different tips. I then went around the top edge of the cake with the pink frosting to make it more girly. Because I did not have a small enough tip to do the face with out it running together I decided to cut out the face of the copy I made and place it on the cake. Baking time for the cakes was about 40 minutes each because of the size. Decorating time was about an hour but this was mostly because I had to stop and refill my pampered chef cake decorator. 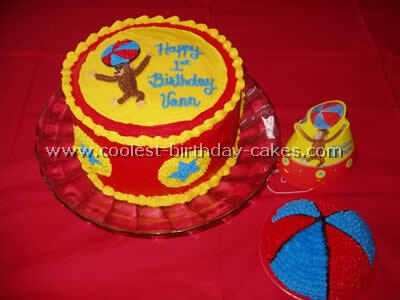 This Curious George cake was a very easy and fun cake to do. It was a hit! 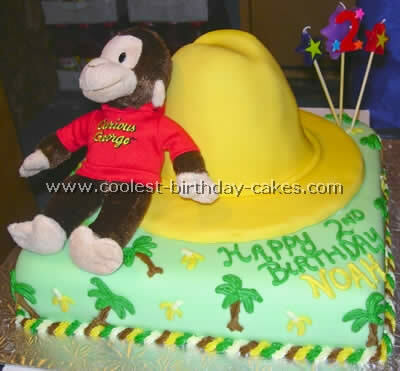 This Curious George cake was made from a 12 x 18 sheet pan. The party that it was made for wanted a specific George picture so I enlarged the image to fit the cake and traced it onto parchment paper with an edible marker. After icing the cake with butter cream icing I transferred the image by poking the outline on the cake with a toothpick. I then traced the holes (like connect the dots) and had the image on the cake. I filled in the rest with the star tip. 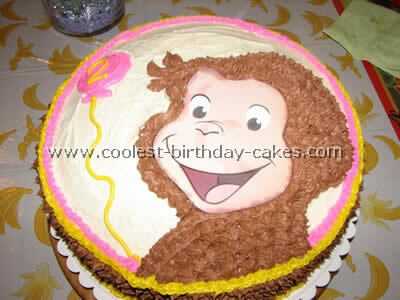 We had a lot of fun with this Curious George cake. One round cake for the head (cutting off the top for a flush finish) small square on bottom (cutting off top and sides for flush and arm/neck appeal) then iced with different colors to match picture. The eyes were marshmallows and we used black gel for mouth eyes and ears. It tasted like a dream come true! Dark Chocolate cake and icing with milk chocolate face! My twins fell absolutely in love with Curious George when they turned about 8 months old. 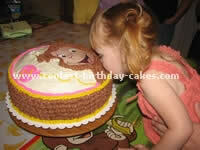 We knew then that their first birthday had to be a Curious George cake. For their individual cakes we just used an edible computer image and decorated them slightly different for individuality. For the main cake we used two different flavors for the cake: chocolate and strawberry. To help support the weight we bought these cool things from Michaels but I can’t remember the name for them. They were right in the cake aisle! We used another edible image for the topper and made it out of sugar and icing so it would stand up. For the bananas we used runts and they were a HUGE hit. 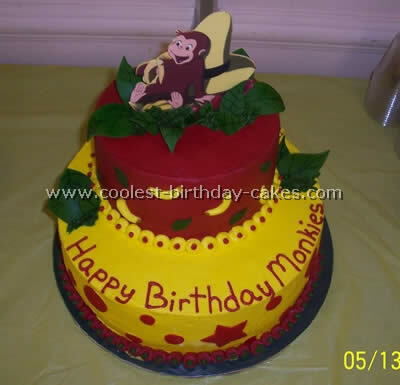 I credit this cake to my talented computer friend who showed me how to turn graphics into a wonderful Curious George cake! 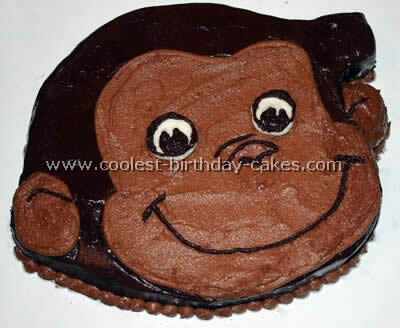 Curious George cake by Pandy S.
I rented a 16×16 inch cake pan and filled it with 3 cake batters and baked it about 45 minutes until nice and moist. I then picked my favorite picture of Curious George and drew it on a large piece of paper. I traced the outlines of this paper onto wax paper. 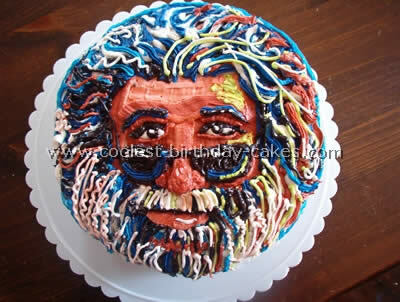 On the wax paper I again traced George with white piping gel and then smoothed it over the cake. I cut out around the edges of his face and could still see the white piping gel to form my pattern. I used black piping gel to outline all parts of George’s face (edges ears eyes nose mouth and the separation between tan and brown). Then I make my icing and used a tiny amount of brown to make the tan color and much more brown to make the dark brown. I used a #16 tip to make the star pattern covering the rest of George. I used the black and white piping gel to fill in George’s eyes. On the banana I used a large piece of leftover cake cut off from the edge of George’s face. I cut out a shape larger than needed but curved like a banana and then I started tapering the edges off until it had the look I wanted. I covered it with smooth yellow icing and then wrote his name and age in the leftover brown icing. The whole Curious George cake turned out wonderful and people could not believe I made it from scratch when it was quite easy. 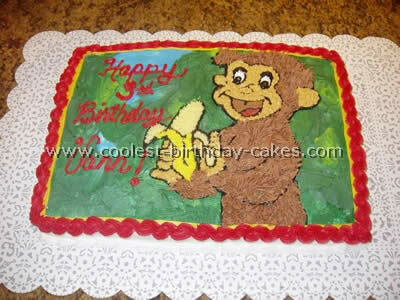 Andrew loved the look of the Curious George cake and he is still talking about how much he loved his banana cake. The cake recipe is from Wilton and can be found at www.wilton.com. It is the Double Fudge Groom’s cake and the frosting recipe’s are from the Wilton site too. This is a combination of their Chocolate Butter cream and Regular Butter cream. 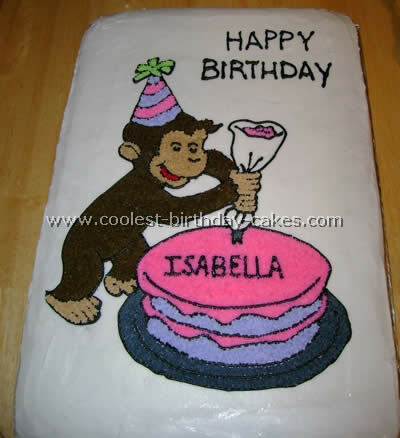 The cake template is from a Curious George mask I found at www.pbs.com. I enlarged it on my computer and then traced it onto wax paper and cut it out then laid it on a baked sheet cake and cut around it for the outline. I then frosted the entire thing in full strength Chocolate Butter cream, first outlining the face and then filling it in. I piped the frosting onto the sides with a bag before smoothing it with the spatula. If this recipe is hard to spread or pipe add light corn syrup 1 tsp at a time beating in between additions until it spreads/pipes easily. For the face I cut the face portion out of the template and laid it onto the chocolate frosted cake and made indentations all the way around it with a butter knife then lifted it off and outlined and filled in with the tan frosting. The tan frosting is 1/2 chocolate frosting mixed with 1/2 plain butter cream with yellow and red food coloring added to make it more tan. Before adding the eyes, mouth and nose I drew them in with a butter knife re-smoothing when it didn’t look right and then piped on chocolate frosting over the indentations. This Curious George cake was done for my son’s first birthday! At such an early age he just loves George! 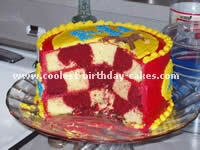 This was done as a double layered checkered cake – red and yellow which added much detail! The George image was just inverted on the cake with piping gel and then star tipped the colors in. Then the stars were added on the side. The ball that George always plays with was done as my son’s "own" cake to dive in to! This ball cake was done with a small round cake pan. He loved it! 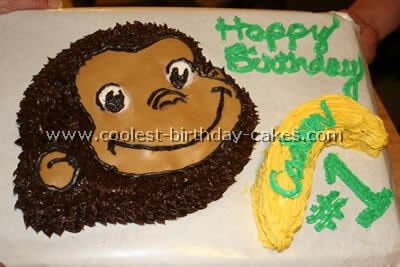 This was a Curious George cake that I did for my son! He absolutely loves George! I used the Wilton tip that is used for "grass" for the brown "hair" on Curious George! It gave it a great texture look and turned out looking just like edible hair! The image was just traced off of a napkin and was enlarged on the computer and then inverted with piping gel onto the cake. Just invert the image and start filling in with color. The background of the trees was just a few different shades of green blended in together. This was a really fun cake to do and brought lots of smiles!